The Monument commemorates the victims of the Macrossan bus smash of 1948. 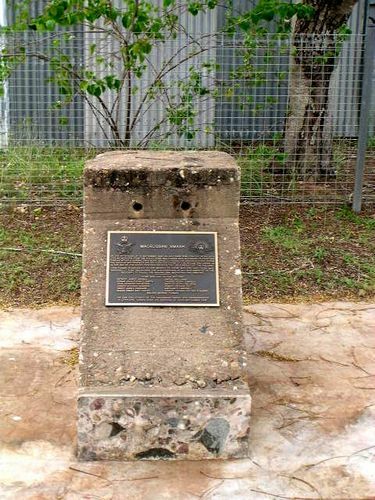 On 16th Sept 1948, an RAAF semi-trailer bus laden with civilian workers from the RAAF base Macrossan ran off the Burdekin traffic bridge, when the front wheel ran up the bridge kerbing. There were no bridge railings, and the bus went over the bridge, and landed upside down on huge rocks in the dry river bed. Thirteen people died as a result of the accident. The fiftieth anniversary of the accident was commemorated in Charters Towers over the weekend of the 19/20 September 1998. On the afternoon of 16 September 1948 an airforce semi-trailer laden with civilian workers from the R.A.A.F Base Macrossan was returning to Charters Towers after a normal days work. While crossing the Burdekin River bridge the vehicle accidently rolled over the chime of the bridge and ended up in the bed of the river. Thirteen persons died as a result of the accident. This plaque is dedicated to the memory of those who died and those who survived. It also recognises the contributions of all who assisted in the recovery, attended the injured and supported the families.